Solve your favorite problems faster for graphs that matter! Graphs in the real world tend to have a lot of special structure. In particular, graphs arising on this planet are often planar (or nearly so), meaning that they can be drawn in the plane or a sphere without any (or with few) edge crossings. This class is about efficient algorithms that exploit the structure of planar graphs and related graph classes, specifically graphs embeddable on a surface of low genus and graphs excluding a minor. We will focus on recent results in this exciting area (which all of the instructors actively do research in). We will organize an optional problem-solving session, during which we can jointly try to solve open problems. In the past, these sessions have led to important new results and published papers, as well as class projects. Class projects more generally can take the form of formulations of clean, new open problems; implementations of existing algorithms; or well-written descriptions of one or more papers in the area. Projects can be purely mathematical and/or theoretical computer science (algorithmic/complexity theoretic), or purely practical. You can reach all the instructors of 6.889 by sending an email to 6889-staff K5 csail.mit.edu (replace the clique by an @). Alternatively, permission from the instructor. Written project and project presentation. Small number of problem sets. 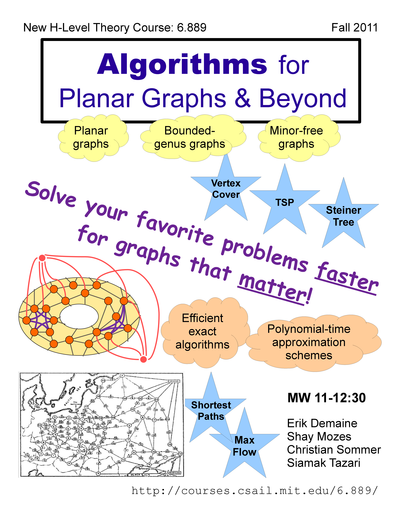 "Optimization Algorithms for Planar Graphs" by Philip N. Klein (draft). If you are interested in attending the class, for credit or as a listener, please join the 6889-students mailing list. This is the first time a class like this is offered at MIT. A related class has been offered before as CS 250 / CSCI 2950-R : Planar Graph Algorithms at Brown University by Philip N. Klein.